Softening oil rub: You can soften your calluses by applying any of the following oils—wheat germ oil, castor oil, sesame seed oil or olive oil. Apply the oil as often as possible throughout the day, day after day. It might take several weeks to clear up the patch. Simple soak: Add one tablespoon of baking soda to a basin filled halfway with lukewarm water, and soak your feet for 15 minutes. This should soften up the callus. Then take a pumice stone (available at health-food stores and pharmacies), and carefully buff away the tough skin. Never use anything sharp to cut away the callused area. 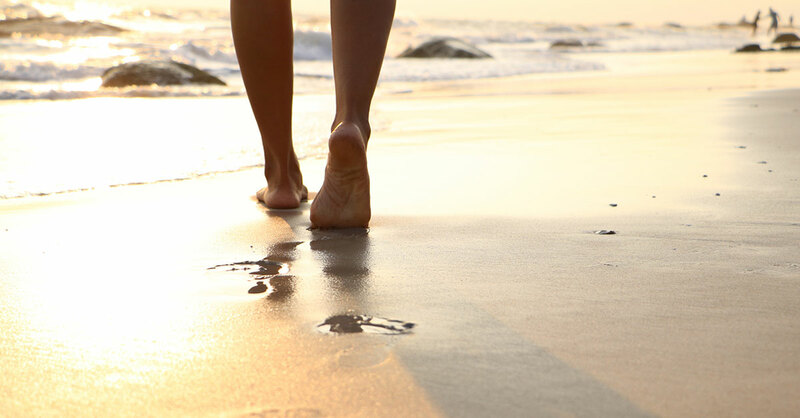 A walk on the beach: Walking barefoot in the sand, particularly wet sand, is wonderful for your feet. It acts as an abrasive and sloughs off the dead skin that leads to corns and calluses. Foot salad: Cut an onion crosswise into two big slices—use an onion large enough to cover the callused area. Let the two onion slices soak in wine vinegar (red or white) for four hours, then take the onion (one slice for each foot or wherever needed) and apply them to the calluses. Bind them in place with plastic wrap, put on socks and leave them on overnight. The next morning, you should be able to gently scrape away the calluses. Be sure to wash and rinse your feet thoroughly to get rid of the onion/vinegar smell. Help for cracked heels and soles: If you have deep cracks in those thick, unsightly calluses on your feet, lotions, herbal salves and petroleum jelly offer little benefit because the problem is caused more from the inside than the outside. Deep cracks on the bottoms of your feet can indicate a deficiency in vitamin A. Vitamin A is not abundant in food (except in liver). Instead, the body makes vitamin A from beta-carotene, a nutrient that is plentiful in beets, carrots, cantaloupe, sweet potatoes and squash. You can also take a beta-carotene supplement. A typical dose for callus cracks is 50,000 international units (IU) daily, taken with food. You may need to do this for several months for lasting results. After your feet improve, consider taking 25,000 IU of beta-carotene daily as a maintenance dose. Caution: See your foot doctor if your calluses are painful and/or debilitating. If you have lung, liver or heart disease, are a smoker or heavy drinker or take prescription medication, check with your doctor before using a beta-carotene supplement. Do not use if you take a multivitamin that contains vitamin A. Thanks to Jamison Starbuck, ND, columnist for Bottom Line Health, and MayoClinic.org for help with these tips.